My sister and brother-in-law's T5 Ranch is located just outside of Anderson, Texas; a 450-acre beautiful picture of God's nature and clear skies. I reflect on the time my youngest son, Pierce, and me spent there last Sunday. When I took walks, the path I followed took me across several cattle guards. 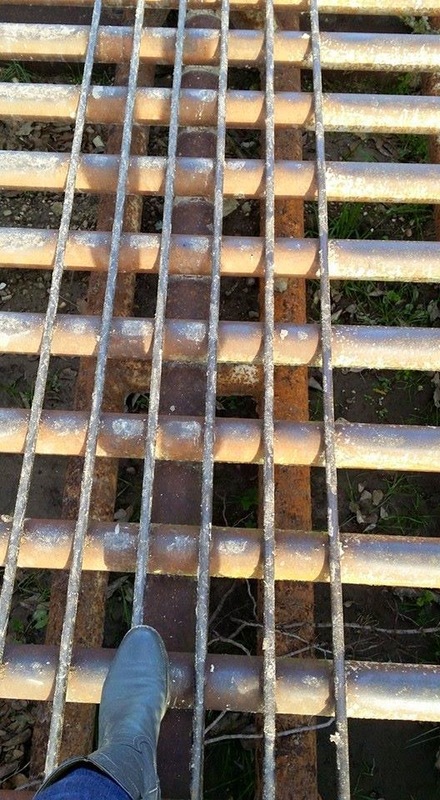 As you can see in the picture, there is solid footing for a human to carefully cross over, but the wide open weave pattern of the heavy metal grate makes it just about impossible for cattle to cross. On one of my walks, God gave me a word picture, that as Christians we can choose to navigate new challenges in our lives. Challenges that seem impossible to accomplish, but when accomplished result in help to those that live with invisible challenges like mental illness. To cross that cattle guard or any other obstacles, we can ask God to show us how. And, since we as Christians have the Holy Spirit within us, allot of times it comes down to faith and not giving up on the calling God has given us. We need to be strong, in God's strength, to make it to the other side of the cattle guard; to then assist those who need help navigating the cattle guards they happen onto; the obstacles in their lives. I believe in my life God has called me to spread the word on mental illness; in this blog, on my Facebook Page, emails, texts, chats, visiting with people I don't even know. No word that goes forth from His mouth returns to Him void. I educate, share a message of hope, identify resources, make myself available to individuals struggling, help families understand their loved one's mental illness; rewind and do it all again. I grow weary at times because I can't see progress as fast as I want. I believe that comes from living in the trenches, struggling myself with treated depression and anxiety, losing our 4th child Carson Brooks to suicide due to unstable bipolar, and having another child who struggles with bipolar. I see the pain everyday. I could use your help. I would love for others to join me in learning how to cross over your obstacles (even if it isn't a cattle guard) to join God's MENTAL HEALTH ARMY; to help those who struggle in painful silence with mental illness, or if you yourself are struggling with a mental illness. Contact me 424/BJOYFUL (424/256-9385). Take that 1st step! Call me if you have questions. God will hold your hand, and I will be there to cheer you on! Running towards Jesus with open hands. Dangerously surrendered to whatever He calls me to do. If you live in the Dallas area, Todd and I lead a FAMILY GRACE GROUP, a support group for caregivers of those struggling with mental illness. We meet at our church, Fellowship Church, Grapevine, Texas, the 1st and 3rd Thursday of most every month of the year (www.fellowshipchurch.com > Get Connected > Member Care > Family Grace Groups).